Comey’s “investigation” was a farce. Any former prosecutor worth a flip would have convened a grand jury, issued subpoenas, gotten search warrants, seized computers, run wire taps, indicted the Clinton cabal, and squeezed the underlings to plead guilty and cooperate. This business of friendly chats, immunity agreements handed out like party favors, and side deals that include the Attorney General approving the destruction of evidence to keep it from Congress doesn’t happen for others targeted by the feds. Just ask any number of Wall Street executives who for various reasons found themselves on the opposite side of the Department of “Justice.” In fact, my former client, Jim Brown, served a year in prison convicted of perjury and obstruction of justice for testifying about his personal understanding of a telephone call to which he was not even a party. Yes, you read that correctly. Read Licensed to Lie: Exposing Corruption in the Department of Justice. It becomes more relevant every day. Thanks to the work of Judicial Watch and others, we learned over a year ago now that Hillary Clinton ran the most important and confidential of world affairs and the United States Department of State through an unsecured computer server assembled by her minions and ensconced in the basement of her New York home. She did so despite repeated warnings of security risks, against protocol, and contrary to her own memo to all of her underlings. That posed no problem simply because the rules don’t apply to Clinton. Conveniently, her server also handled Clinton Foundation correspondence that facilitated the personal enrichment of Hillary and Bill by hundreds of millions of dollars. That money came from Bill’s remarkable “speaking fees” at hundreds of events around the world—each of which was quickly approved as requested by Clinton crony Cheryl Mills at the State Department—as if there were no conflict of interest. Simultaneously, foreign entities made “donations” of hundreds of millions of dollars to the Clinton Foundation to obtain the immediate attention of and curry favor with the secretary of state—and it worked. The conflict of interest inherent in that entire scenario is palpable. It’s the Clintonian equivalent of the scheme former Enron CFO Andrew Fastow conceived that destroyed Enron—a large side-slush fund that operated as his own piggy bank. The Clintons boldly went where no one has gone before: They privatized the State Department for their massive personal gain, creating a net worth for each of over $100 million dollars in a few short years. Ironically enough, lead counsel for the Clinton Foundation now was President Obama’s longest-serving White House counsel. A former prosecutor on the Enron Task Force, Kathryn Ruemmler was implicated in various forms of prosecutorial misconduct and its cover-up. The personal home server allowed Hillary Clinton to send and receive all of her emails and run the State Department free from protected, secure, and requiredgovernment channels. It was established deliberately to circumvent the Federal Records Act and the Freedom of Information Act—both of which applied to her work-related correspondence. That was no problem for Clinton however, as she simply “didn’t know how to use a computer,” apparently was incapable of learning to do so (unlike most toddlers in the country), and she liked her Blackberry—which was reason enough for her highness to ignore the national security interests of the entire country. Clinton’s insistence on operating outside the government security protocols demonstrated at best deliberate disregard for the law and national security—and, at worst, conduct that was treasonous. That is why 18 USC 793 (d) and (f) make it a crime punishable by imprisonment for 10 years to even move any information relating to the national defense from secure conditions or to fail to return it upon demand. Clinton did both—repeatedly. The unsecure server also facilitated the clearly conflicting roles of Clinton confidant and protégé Huma Abedin, who was paid simultaneously by the Clinton Foundation and the taxpayers through the State Department. That made it easier for the double-dipping Abedin to schedule meetings quickly for Clinton with those who had paid to play—substantial donors to the Foundation, such as the Crown Prince of Bahrain, who had been denied a face-to-face through those pesky State Department protocols in place for mere mortals. His millions in contributions to the Foundation got him an appointment with Clinton through Abedin in a matter of hours. We wrote more than a year ago—as soon as we heard one Clinton server was “wiped”—about the Countless Crimes of Hillary Clinton. We foresaw the need for a special prosecutor and predicted that if emails could be found, they would likely implicate high ranking people across the government, including the president. Lo and behold, President Obama, who told the country he heard of Clinton’s private email from news reports, was in reality emailing her at Clintonemail.com and using an alias. He must have forgotten. But, wait—just this week, we get more emails, and there’s now evidence that the White House and the State Department coordinated an attempt to minimize the problem. Now we have a candidate for president of the United States who has committed lie after lie, obstructed justice, and destroyed evidence with the support of the president himself—conduct for which many people are in prison. Sometimes it’s called False Statements to federal officials, punishable by up to five years in prison under 18 USC 1001. Under other circumstances, such as in sworn statements to federal judges or testimony to Congress, it can be perjury under 18 USC 1621 or 1623. Remember the man relentlessly prosecuted by the feds for throwing a few fish overboard? That case had to go all the way to the Supreme Court for them to decide that fish weren’t the kind of tangible objects/evidence to which Congress intended the new obstruction statute to apply. But emails, computers, and servers are. Senator Clinton voted for that new statute—but it doesn’t apply to her. Well, it would, but Loretta Lynch and James Comey just agreed to destroy evidence of it themselves. These false statement and obstruction offenses are so easy to prove that prosecutors often tack them on to already multi-count indictments just for good measure when they want to hammer Wall Street bankers or other citizens and business people who actually work for a living. How many of these federal criminal offenses are established by the limited evidence that has been pried out of the Clintons’ hands or resurrected from unsuccessful although mighty attempts to destroy it? They are truly countless, as each email would be a separate charge but, for the sake of brevity, we’ll just pick three or four—that don’t even include all the conspiracy charge options routinely used by “reasonable” prosecutors. First, Clinton testified to Congress that she “turned over all of her work-related emails.” Second, she “only wanted to use one device.” Later, she chose her words carefully, claiming “nothing was marked classified when it was sent or received.” That sounds good to people who are not lawyers, but it’s Clintonese and not the law. She “turned over all her work emails”? First, her friend Sidney Blumenthal found a number of emails he exchanged with her about confidential matters of State that she didn’t produce. Next, that pesky Pentagon found over 1,000 emails between Hillary and General Petraeus alone. Most recently, the FBI found roughly 15,000 Clinton thought had been erased completely when she had her servers “wiped” professionally with BleachBit. We’ll never know how many were deliberately destroyed to protect her incompetence and corruption. Mills, Samuelson, and others at Platte River Networks destroyed whatever they wanted. As both secretary of state and an attorney who had long been paid by the taxpayers, Clinton should know that information “relating to the national defense” is what is protected under 18 USC 793(f). It doesn’t have to be “classified”—marked or unmarked—even though much of it was. Sure, let’s give her the presidency and the nuclear codes and access to every national secret—ISIS can just hack her and use our own missiles to destroy us. They won’t have to worry about trying to bring nukes into the country. In any event, according to the FBI’s perfunctory investigation, more than 2,000 of the emails available are classified as Confidential or Secret or higher. Clinton may have only wanted “one device,” but the truth is that she had 13“personal mobile devices that were lost, discarded, or destroyed.” Reporter Sharyl Attkisson has an excellent timeline of irrefutable, no-spin facts derived from the part of the FBI’s file that has been made public. The timeline of events alone is damning. It is about the fair administration of justice and trust in our justice system. It is about the accountability of our highest officials. It is about destroying evidence in the face of a serious investigation. It is about national security breaches of the highest order, and it’s about the privatization and sale of our State Department for personal enrichment. The conduct of the Clintons, their cronies, their Foundation, and now our highest law enforcement officials make the entire Watergate scandal look like an insignificant computer hack. Where is the Congress? Where are what used to be our great newspapers? The sounds of silence are terrifying indicators of how government-controlled our mainstream media has become. I guess that’s why Reporters Without Borders has dropped our Freedom of Press rank to 46th world-wide. 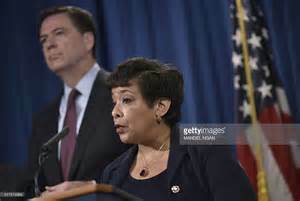 FBI Director James Comey and Attorney General Loretta Lynch should be impeached for their roles in whitewashing Clinton’s crimes and their own participation in the destruction of evidence. They facilitated and participated in the obstruction of justice—spitting in the face of the Congressional investigation. Congress should be able to name a special prosecutor when the Attorney General has a clear conflict—such as meeting secretly with Bill Clinton during the “investigation” and receiving a promise of continuing as Attorney General if Hillary is elected President. The timeline of events and their conduct reek of corruption. Stay tuned. Clinton’s answers under oath to D.C. District Judge Emmet G. Sullivan are due October 13. Remember, he’s the judge who appointed a special prosecutor to investigate the Department of Justice following the Bush administration’s corrupted prosecution of former Alaska Senator Ted Stevens. And it was Judge John Sirica—combined with what was then the great Washington Post—who exposed the Nixon corruption. With more and more government intrusion in every aspect of our individual businesses and lives, we are quickly losing the land of the free, and we now must wonder if any of the brave are home. Who has the chutzpah to stand up to the Clintons? Where are the real Americans? Hopefully, on election day, they will pour out in droves and resoundingly demand real change. The election and Judge Sullivan are our only chances for justice at all. Definitely Comey should be tossed. He interrogated Hillary without a Miranda warning for anything, thus giving her an escape hatch, and failed to charge her. That deliberate screw up probably saved his life, unlike many other Clinton enemies! TO THINK THAT BOTH OF THESE DEPARTMENTS WORK FOR THE USA IS DOWN RIGHT DISGUSTING. AND YET THEY US TO OBEY THE LAWS AND THEY DON’T WANT . IT IS TIME TO FIRE THE WHOLE GARBAGE DEPT.